As if it wasn’t clear enough, we’ve gotten about as good confirmation as any that there are new iPads on the way. 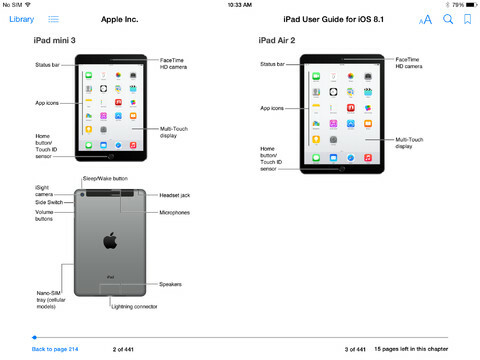 The iOS 8.1 user guide for iPad just showed up on iBooks and shows images of the new iPad Air 2 and iPad mini 3. The images show off a new Touch ID home button, which should make logging in easier. They also confirm burst mode for the cameras, taken by holding down the shutter button as on an iPhone. Be sure to stay tuned tomorrow as we find out more about the new devices.